Wood-based products can behave like mini-earthquakes. (Inside Science) -- Similar rules may govern the squeaking of an old hardwood floor, cracking of a dried-out lump of charcoal, and shearing of our planet’s crust during an earthquake. Two recent studies in the journal Physical Review Letters have found that all of these stressful situations share the same underlying mathematical patterns. The findings could help improve earthquake modeling, and perhaps allow future researchers to replicate "the big one" on a tabletop. Seismologists have long known that the relationships between the sizes and frequencies of earthquakes can be described mathematically. But even after decades of study, they can't completely describe what physical processes underlie these trends. Small-scale experiments have shown that earthquakes cannot be entirely explained by the squeezing of individual rocks. Compress and shear a single rock as if it were six miles underground and experiencing an earthquake, and it reacts extremely violently – so much so that this reaction, if scaled up to the size of an earthquake, "would literally kill you by shoving your legs through your head," said Thomas Heaton, a seismologist at the California Institute of Technology, in Pasadena. Something is making earthquakes "gentler" than the sum of their parts – a longstanding "stress paradox" that's plagued seismology for the last forty years. To help answer these nagging questions, scientists have been looking for small-scale systems that can realistically imitate the Earth's rumblings and grumblings in the lab. Stress is stress, the thinking goes, and all materials have some way of deforming to compensate – including charcoal, as Haroldo Ribeiro, a physicist at Brazil's Universidade Estadual de Maringá, found in his study, published on July 7. It was a barbecue, of all things, that sparked Ribeiro's initial interest in the problem. Some time ago, his colleague showed him that soaking charcoal in alcohol effectively makes it spring-loaded. The liquid evaporates at different rates in the charcoal's interior and exterior, causing stress and pressure to accumulate. The drying charcoal can crack with surprising gusto, producing an audible sound. Ribeiro began recording these "acoustic emissions" with a microphone. Mathematical patterns he found in the recordings mimicked patterns that have been found in earthquakes. In 1894, Fusakichi Omori, a researcher at the Imperial University of Tokyo, showed that the number of aftershocks -- sometimes small and sometimes severe temblors following an earthquake -- drops off predictably after the first and largest shake. If there are 120 aftershocks during the first day after an earthquake, then there will be about 60 on Day 2 – half of Day 1's total – and 40 on Day 3, one-third of Day 1's total. The cracking of charcoal was consistent with Omori's law. Separately, the relative frequency of larger and smaller pops in the charcoal followed an orderly pattern consistent with another earthquake pattern found in the 1950s by Beno Gutenberg and Charles Francis Richter, seismologists at the California Institute of Technology. The Gutenberg-Richter law says that earthquakes at least 10 times more powerful than a given quake happen about 10 times less often. And when cracks in the charcoal were severe enough, their largest aftershocks settled out at energy levels roughly 16 times weaker than the cracks themselves. That's exactly how much weaker the strongest aftershock of an earthquake is than the earthquake itself, as Swedish seismologist Markus Båth discovered, also in the 1950s. "The earth is not so different from a piece of charcoal, for this particular experiment," said Ribeiro. "You have tension, you have the cracks -- so it's something you probably would expect." Over 7,000 miles away, near Helsinki, Finland, Aalto University physicist Mikko Alava and his research team worked on a similar problem: How does wood bend and break when it's compressed? They examined the sounds wood makes when stressed. "It's a known fact that wood crackles when you walk on a parquet floor or sit on a chair," said Alava, "but the question remained: What can we actually say about [the cracking], at the end of the day?" Alava's team compressed blocks of pine in vises. A microphone recorded each block's moans and groans, while cameras tracked signs of stress on its surface. Though the wood appeared to bend smoothly, the measurements revealed that it actually reacted to stress in punctuated, intense bursts, as occurs during avalanches and earthquakes. 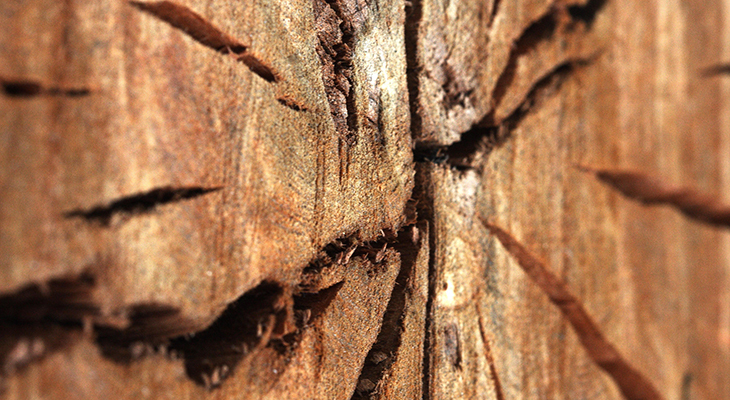 The "woodquakes," like Ribeiro's charcoal cracks, also obeyed the Gutenberg-Richter law and Omori's law. Physical Review Letters will publish Alava's study on July 20. The fact that materials as different as brittle charcoal and flexible wood share similar reactions to stress, said Cornell University physicist James Sethna, tells us that we shouldn't sweat "what's happening on the cellular level of the wood or the boulder level on the earthquake fault." Instead, we should do more to better understand these materials' larger-scale behavior, like how they broadly handle the stresses at the tip of a crack. What makes a small crack grow into a medium-sized crack? And how do medium-sized cracks turn into large ones? Ribeiro and Alava said they are planning further studies of the universal physics of cracking, which could help us understand how perturbing an earthquake-prone area – perhaps by pumping water into a fault zone – could impact earthquake activity. But predicting exactly when and where a major earthquake will strike will remain fiendishly difficult: It's the difference between knowing a baseball player's batting stats and knowing exactly where the next ball will be hit. Michael Greshko is a science writer based in Washington, D.C., who has written for NOVA Next, the National Academies, and NYTimes.com, among other outlets. He tweets at @michaelgreshko.